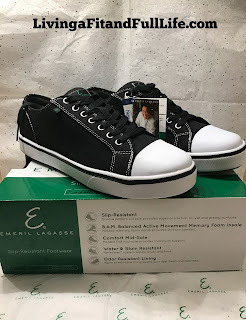 Living a Fit and Full Life: Emeril Lagasse Footwear - The Perfect Slip and Stain Resistant Work Shoes! + Giveaway! Emeril Lagasse Footwear - The Perfect Slip and Stain Resistant Work Shoes! + Giveaway! Chef Emeril Lagasse and Jack Schwartz Shoes Inc.(JSSI) announced a partnership to produce a new shoe line specially designed for professionals in the restaurant industry. A private company, JSSI has been in the footwear business for over 80 years, designing and distributing footwear. Ermerils Footwear is being distributed by S4 LLC, a JSSI related company. 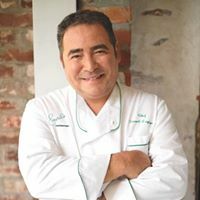 Culinary icon Emeril Lagasse, the founder of twelve restaurants and star of popular shows Emeril Live and Top Chef, brings to the footwear industry his years of restaurant experience and an intimate understanding of the particular demands of culinary professionals. Emeril Lagasse slip and stain–resistant footwear will offer restaurant industry professionals shoes designed to provide maximum protection and comfort for demanding work days. Emeril Lagasse duty shoes reimagine work footwear with innovations in style, safety, and comfort; the shoes will be available for purchase starting November 1. 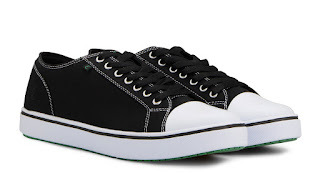 The Men’s Canal Canvas is a classic lace to toe casual oxford sneaker with a canvas upper, metal eyelets, rubber cap toe, padded collar and green rubber outsole. These slip resistant work sneakers feature the ultimate combination of cutting edge design and technology to provide top notch performance for occupational footwear. These stylish and innovative sneakers can be purchased in both regular and wide width sizes and are also available for Women. Emeril Lagasse Footwear Line is perfect for those in the restaurant industry! Emeril’s shoes feature multiple innovations that are specifically tailored to the restaurant environment such as their slip and stain resistance as well as their superior comfort. Many people in the restaurant industry are on their feet for most of the day so having a shoe that is comfortable is an absolute must. I remember back in the day when I worked at a restaurant and even though I was much younger in those days my feet would ache at the end of the day. I also remember in culinary school spilling stuff on my shoes extremely often so I love that these shoes are stain resistant. Another terrific thing about these shoes is that they're extremely fashionable and can even be worn when not at work. Emeril Lagasse Footwear Line is a terrific solution to all those in the restaurant industry seeking a practical yet stylish shoe to wear! Even if you're not in the restaurant industry these shoes would still look and feel amazing on your feet. I know as a mom of 4 I could definitely use a shoe that offers slip and stain resistance as well as comfort and style! Click HERE to find a store near you that sells Emeril Lagasse Footwear! Click HERE to learn more about Emeril Lagasse Footwear! Follow Emeril Lagasse on social media!